Tripwire's WWII shooter Red Orchestra 2 gets its first expansion, Rising Storm , later this year. Yesterday, the dev posted a new gameplay video which shows off the expansion's Pacific Theater hallmarks, including booby traps, flanking spawn bunkers, flamethrowers, and banzai charges, all set within iconic battles including Tarawa, Kwajalein, Saipan, and Iwo Jima. Rising Storm is a Tripwire-backed mod which turned into a full collaborative effort between the studio and the modding team. 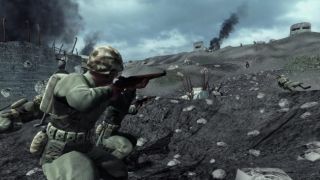 The standalone expansion -- which Tripwire says includes RO2's original multiplayer content as a bonus -- focuses on the war's Pacific front and the fierce jungle scraps waged between American and Japanese forces.